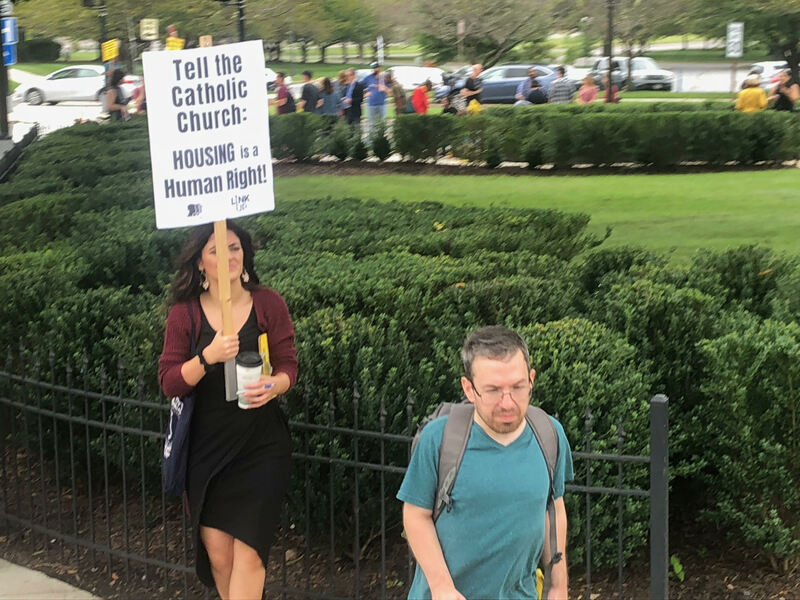 Between 50 and 60 local Washington DC residents protested outside the Basilica of the National Shrine on September 16th over what they perceived as unfair treatment of DC tenants by the Basilica. The outrage happened shortly after local DC tenant Joann Doyle passed away last February. After her passing, friends and family donated her four-unit rent-controlled property to the Basilica, with the intent that it would be used to either help the homeless or for other charitable outreaches. However, after the donation the Basilica attempted to sell the land which led to people to protest. The properties include housing on Girard St. N.E., Raum St. N.E, and Bryant St. N.E. In a letter dated August 28, the tenants wrote, “Due to the imminent time frame of our potential displacement, we are making a public appeal to the Basilica, to give immediate attention to our impending housing situation. We ask you to meet and work with us as tenants of Northeast Washington, DC, and to craft a solution that protects the affordability and future of our homes.” The letter said that for two of the buildings the Tenant Opportunity to Purchase Act (TOPA) rights expired and the other two are attempting to use the TOPA rights to “secure future availability”. Many people were not happy about the displacement, which led to the creation of a Facebook page titled, “Take Action! Say NO to the Catholic Church Displacing DC Tenants” on September 12. Of the 106 Facebook users interested in attending the protest, only 46 people committed to joining the demonstration. Local DC grassroots showed up at the protest as well, including individuals from Black Lives Matter DC, Jewish Voice for Peace, and DC Socialist Alternative were very vocal about their feelings toward this particular matter. Protesters passed out flyers instructing others to help their cause by calling the Basilica, and informed people what was happening within the Catholic Church. Students from other colleges and universities in Washington also came out to support of the protest against gentrification and encouraged young people throughout the city to stand up against the rising costs of housing and for the residents of the city. The Basilica was aware of the protest and said they have followed exactly everything they were supposed to do, respecting the rights of the tenants. Most protesters believe their rally will bring awareness to this cause, but freshman undergraduate Joseph Rooth disagrees. Rooth believes that the Church could have done a better job handling the situation, but he doesn’t believe their protests will make an impact to the Church. ← Previous Previous post: The Beginning of the End or The End of the Beginning?